The book said "bleach your possibly disease ridden pots." So I bleached my possibly disease ridden pots. The book said, "put down pebbles in the bottoms of your pots." So, I put down pebbles in the bottom of my pots. Then the book said, "mix sand with your potting soil." and that's where I stopped. There's always a limit to everything. A limit to getting things done, a limit to details, there's just a limit. 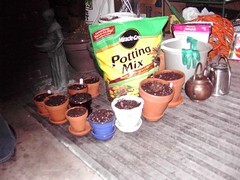 Mixing sand with potting soil was my limit. Bleaching the pots and actually having pebbles from a past project was stellar in my book. The sand would be for a time when I had sand around. I'm not a detail sort of girl so I was pretty damn proud over my neat rows of potted bulbs. They're for later this next year, about January and Februrary when many of us go stark raving mad for color, please God, color. Some of us around then need something different from glaring white or the washed out hues of brown and yellow. These little pots hold gems of color and I trust they will not let me down. I'm going to do it right this year and monitor them like people with hard hats monitor nuclear plants. That's right. That's monitoring. Last winter was a financial failure. I got my pots, my soil, my bulbs and with very limited information, I planted and stored the bulbs away. I watered faithfully but come around January, something was horribly wrong. Nothing grew, nothing came out of the soil. I was in a funk with the failure of it but steeled myself. Next year, I vowed, next year, I would arm myself with intel and get these little things to bloom. And yes, oh yes, we have the intel. I picked up a discounted book on bulb forcing from Smith and Hawken in the late Spring when the sting of forced bulb failure was low. I read the book and realized all the terrible mistakes I had made. They were terrible. And then I put the book away and went through the summer, languishing in the heat, picking up on the cooler days. Just having your basic summer. Today, I followed the book- almost absolutely. My bulbs and their pots are tucked into the garage. I have written down dates in my date book (take out pots to be warmed in cool room, etc, etc). I have figured out how to deal with the garage freezing (put the pots in old stryofoam coolers! Go figure!). I have labeled them. They are a small army but they will succeed. Now sitting here, reading a bit more on forcing, having laid out the dates of when to do this and that, I settle into the couch and think, wow, the taste of doing something well tastes very good indeed. This rarely happens because I tend to jump steps in my haste or do something by myself without stopping to get info. This time I didn't. And it's all over. They're all settling in, getting ready to sprout their roots. And thinking about this leaves a good taste in the mouth. I am pleased with my work. And that's no small thing for a hasty perfectionist to say.